Moira Gilbert and Laura Menz blend herbs, spices, and flowers to maker their flavorful small-batch mixers. 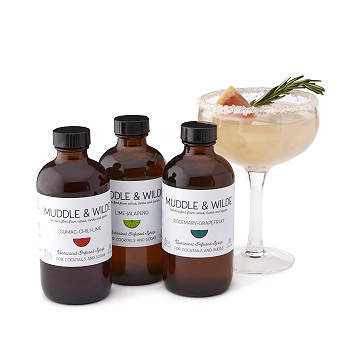 What are the requirements to mix with these craft cocktail syrups? Answer: D. You don't have to be a hipster bartender to make a fantastic drink at home. Moira Gilbert and Laura Menz's low-sugar, citrus-based botanical syrup sets are all you need to make quick, delectable cocktails and mocktails. The handmade herb, spice, and flower blends pair perfectly with your spirit of choice. Each has a uniquely wonderful fragrance and an amazingly complex flavor profile that's sweet, sour, and bitter all at once. Keep some for yourself, and save some as gifts for your favorite party hosts (twirly mustache or not). Choose the Trio for Rum/Whiskey or the Trio for Tequila/Mezcal. Made in southern California with local organic citrus fruit and organic botanicals from northern California. Born and raised in Germany, Laura Menz got her degree in fine arts and graphic design. She moved to Malibu, California to live on the beach and work on sculpture, photography, and fine jewelry design. Moira Gilbert grew up in England, then moved to Los Angeles to set up an international fashion consultancy. Eventually, both women settled in Topanga, California and became good friends. Disenchanted with the sugar-loaded, artificial mixers on the shelf, they gathered fresh citrus and herbs from the garden, made their own, and brought them to a party to make cocktails with. The result was 14 unopened wine bottles and a room full of happy people. They founded their hand-crafted mixers company the next day. Approximately 16 servings per bottle.